A while ago I mentioned the interactive comic that Russ and I thought of doing back in about 1987. And here are a few test strips we knocked up at the time, though now with the benefit of professional Blambot fonts laid in over my scrappy hand-lettering on the originals. Would this have been feasible? A full gamebook adventure in a 64-page graphic novel, say? Looking at it now, it would have been a fair old bit of work. But hard work wasn't something either Russ or I would shirk from in those days. One thing I'm glad to say is that my dialogue writing skills have improved a little bit since then! Anyway, nothing we were contemplating in '87 approaches the mind-bending complexity of Jason Shiga's brilliant branching graphic novel Meanwhile, which is well worth a look to see what happened when gamebooks grew up. Recently I was looking at the manifesto of e-gamebook publisher Mifiction, who have an interesting new take on the whole idea of interactive stories. It’s similar to a direction Jamie and I were discussing a couple of years back, before we got distracted by videogames and comics respectively. Now we have some free time to return to that project, and I’d be interested to hear everyone’s thoughts. Too wide a decision tree and you’ve got very short adventures. Too narrow a tree and the reader’s choices feel constrained. A good interactive novel should provide a different but still satisfying story if you go back and make significantly different choices. As a rule of thumb, Jamie and I always used to figure there should be a minimum of three distinct routes through the narrative, with multiple interweaving strands on each route. Of course, I’m talking about the traditional “one story” kind of gamebook here. Lord Daark Muder has kidnapped your sister and you’re going to get her back, yada yada. 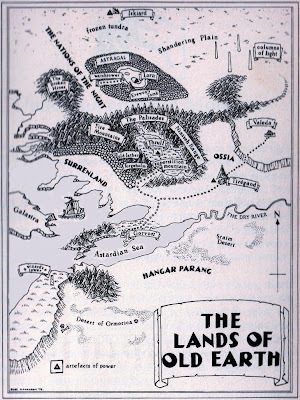 What we were trying to do with Fabled Lands was a whole other thing – more like an open-structured role-playing campaign than a gamebook. In Fabled Lands, you really do get to “choose your own adventure”. When we look at the future of prose fiction – a largely electronic future, perhaps – it seems that a lot of readers could potentially enjoy gamebooks. In fact let’s use the broader term interactive fiction here, not gamebooks, because it’s likely that what has stopped the medium from getting a wider readership has been those intricate game-based rules. Most people are interested in characters and stories, and they are intrigued by the consequences of decisions. But most people have zero interest in rules, numbers, inventories, and other fiddly details. Personally as a writer, I’ve always been more interested in the “book” and less in the “game”. So I’m very keen to find ways to jettison dice altogether when adapting our material to e-readers. I’d certainly count it a failure if you are tapping on your iPhone screen to roll some virtual dice. Entering the village, Ketzel paused to consider two buildings dominating the main street. One was a squat low-roofed dwelling set on study black timbers. A man stood on the porch sweeping idly at the grey dust that had blown in off the plains. To the other side of the street: a tavern with three chimneys of extraordinary height. The glaring, red-whiskered man at the door was evidently the proprietor. Before Ketzel could even begin to consider his next course, something happened that would force him to change all his plans. Interactive fiction has always been based around a single protagonist, for the simple reason that a second-person narrative leaves no alternative. The result is a pretty straitjacketed type of genre narrative. If the hero is Conan, a certain kind of adventure is likely. If Sam Spade, another. But it’s all genre; you’re never going to get Crime and Punishment, much less The Great Gatsby. And, of course, the “you-are-the-hero” form requires the writer to abandon all his most powerful storytelling tricks. There’s no cross-cutting to increase tension, because you only have the one viewpoint. Likewise, no dramatic irony. You can surprise the reader, but it’s hard to use most of the tricks of suspense that rely on the reader knowing something the character doesn’t. Jettison the second-person view, and interactive fiction too can start to tell those kinds of stories. Most interactive fiction in the past has been driven by dice-based game mechanics because the genre had its roots in fantasy role playing. However, the game aspect can be off-putting to many readers. As I said before, most people prefer their fiction without the accompaniment of dice, and prefer not to have to keep notes as they read. The Virtual Reality series in the early 1990s showed that it is perfectly possible to construct an interactive novel without resorting to dice. In our next interactive novel, we’re going to dispense with rules-based gameplay altogether. The setting and story premise will be enthralling in its own right. The pleasure of exploring it via multiple narratives would only be lessened by intrusive game mechanics. Durkesh pulls out the tube of blue concentrate. Does he have a +3 magic vial? If so, reduce its magic bonus by one on the adventure sheet and then turn to 44. If not, turn to 303. Andrew raises the pistol, which startles him with the noise of its bang. A cloud of pungent smoke fills the space between them. The troops fall back as their officer staggers, clutching at the blood welling from his white waistcoat. In the confusion, Andrew makes his escape into the woods, running until he hears no sound of pursuit. What does he encounter there: an angry hermit (turn to 175), a girl of some beauty (turn to 260), or an abandoned chapel (turn to 304)? One of the most imaginative and atmospheric works of fantasy fiction ever written is Oliver Johnson's Lightbringer Trilogy. Each book conforms to a disciplined unity of time, as the titles suggest: The Forging of the Shadows, The Nations of the Night, The Last Star at Dawn. Such evocative names! - don't they send a shiver down the spine? And even within such compressed time-frames, twelve hours per book, an epic story unfolds. In the whole genre of fantasy adventure there is nothing to equal it, except perhaps for Oliver's own The Knight of the Fields, which has yet to be published. It helps that Oliver has a background in role-playing games, I think, because it's only when you've experienced an imaginary world from the inside that this level of authenticity is possible. 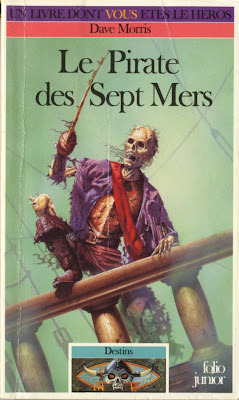 Which is not to say that most RPG referees should launch into writing a fantasy trilogy - far from it. Oliver is almost unique in having both the gamer's grasp of detail and texture coupled with a poet's ability to imbue words with visceral, transformative force. When he describes a battle, you are right there. "What is it like to know you’re going to live forever? Not very pleasant, probably - wouldn’t the spirit be sapped knowing that there was no pressure of time, no finite end? I remember a Borges story, ‘The Immortals’, which had this as its theme. The gods ended up wallowing in mud pools all day, barely bothering to move, so tired had they become of their eternal life. I’m not a great fan of the svelte, charming vamps we find in a lot of contemporary fantasy fiction. I wanted to explore beings for whom the pursuit of blood was a physiological necessity, like an addict’s craving for a drug." Ten thousand years ago, the gods lived on the earth. Reh, god of the Light and the Sun, Iss, God of Worms and Prince of Eternal Darkness: these two were the principles. They fought together at Shandering Plain. The Earth shook at the roar of the battle; the sky went black for a hundred years. And in the darkness, the gods departed. They now live in the stars and their power is exercised by their human servants upon the earth. The two gods wait for that moment when their subjects destroy the worship of the other. The victor will then return: Reh in his chariot of Fire, in a blaze of light. Or Iss under the blanket of eternal night. Does that Eternal Darkness come soon? The earth grows old and, with it, the sun. The summer comes slower and later. The crops are sere and brown and die in the fields. The light of autumn even in the height of summer tints the woods and fields with a melancholy umber: there is no vigor, or sap. Each day the sun sets in violet doom. Iss prays it will never return. But there are some worshippers of Reh who still believe the sun will be reborn. The man you once served, Baron Illgill, Lord of Thrull, was one of these. Yet he brought doom upon his people. He excavated the tomb of Marizian, the great law-giver, and took from it a powerful magic artifact of the gods, the Rod of Shadows. War followed with Iss; soon the Legions of the Worm advanced on Thrull. In hubris, Illgill marched his own legions out to meet them, when he could have withstood a siege for years within the city’s walls. Dark sorcery and the Undead legions who leapt from the soil at dusk defeated the Flame. Thousands died. Their skulls are now built into a pyramid outside the gates of Thrull. 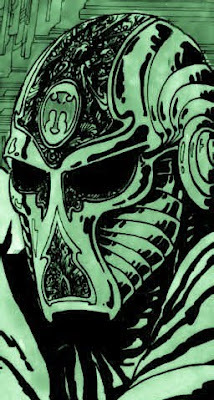 The victor who set them there, Lord Faran Gaton Nekron, Undead Lord, High Priest of the Worm has ruled for six years. The Baron fled to the North and no one knows whether he or his few followers are still alive. Faran Gaton has decreed that the worshipers of Reh will be tolerated, for the moment, as long as they meekly accept their subject status. Once Iss comes, all will see the incontrovertible victory of the Darkness. Unopposed, the legions of the Worm and the Undead spread over the world. From Tiregand their capital in Ossia they have conquered Thrulland, now they move into Surren. The Great Stepped Pyramids of Iss throughout the earth, once abandoned and overgrown with weeds, are being reoccupied by priests wearing the purple and brown. Where can the true servant of the light go..? 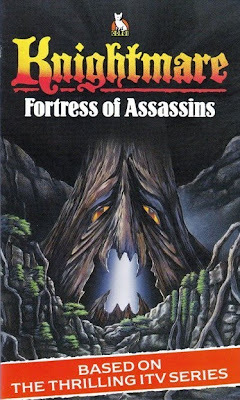 A couple of years ago, Oliver ran a GURPS campaign set in the world of the Lightbringer novels. As you might expect, it was a memorable experience drenched in vivid, brilliantly doom-laden Gothic ambience, as if Lord Byron had got together with the lead designer of ICO to write a set of role-playing scenarios. If there's any demand, and if I can get Oliver to dig it out, we might put it up here in episodic form. Another cross-post from the SCAS blog. This one is probably just for completists, as it's a project that Leo Hartas and I have variously pitched as a TV show, movie and comic over the years. It got quite close as a TV show, actually, but close is no cigar - although recently it resurfaced as just possibly perfect as an iPad edutainment game for kids, and I'm beginning to think that may have been its destiny all along - we just had the idea six years too early! 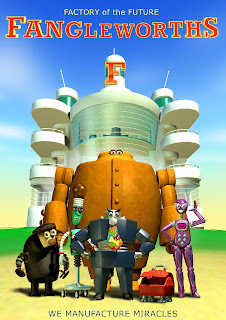 The team line-up there is (left to right) Chug the foreman, Fidel the inventor, Boomer the boss, Rummage the dog, Nettie the real boss, and the big guy is Stacks from the storeroom. Producer: "My boys, do you know what they like? Doctor Who." Dave (already worried): "Oh yes?" Producer: "And do you know who Dr Who is?" Dave: "The Doctor. That's what he's called. Doctor Who is just the name of the show." Producer: "Well, Dr Who is Merlin! Yes! You see, he's a wizard, and he travels in time. And Merlin, he travels backwards in time." Dave: "Merlin was said to age backwards rather than actually travel in time. But go on." Producer: "And over the weekend it struck me. That's what this show needs! The Fangle robots should have a friend who's a time-travelling wizard, and each week he brings them magical gifts!" Dave: "Well, they're already robots. So really a time-travelling wizard would be what we'd call Double Mumbo Jumbo." Producer: "What does that mean?" Dave: "I'll get my coat." The third and final instalment of Tim Harford's design ideas for Dragon Warriors II. The concept of myth levels is something I'd long wanted to implement after seeing the scene in Robin of Sherwood that Tim mentioned before, where the Lionheart mightily throws Little John (surely a case of myth level 3 vs myth level 2), though the concept originally came to me when reading about how the heroes of Chinese myth could stick an arrow through a ghost. And if you've read the third Knightmare novel, which I co-wrote with Oliver Johnson, you'll recall that Hannibal freezes a troublesome kobold in a block of ice. If you're a mythic hero, you don't need magic weapons; you don't even need spells. You can just do this stuff. • Every time a sorcerer casts a spell, he or she must reduce an attribute or quality by one point, permanently. Spell-casting is not done on a whim or for trivial matters. • Sorcerers will tend to have accumulated a combination of arcane objects and magical servants, and it is with the aid of these that most sorcerers wield magical power. • Sorcerers can acquire magical servants or items by casting a spell to summon and bind a demon or spirit. (The process is very similar both for magical items and for personal servants.) Success binds the spirit, which can then be compelled to expend its own attributes or qualities to cast spells. • The risks of summoning are very high. In addition to the sacrifice mentioned above, sorcerers risk having part of their own spirit being captured and bound by the demon if they lose. Perhaps worse yet is the possibility that the demon will be able to prolong the contest into an unholy stalemate. If a suitable spirit is not readily to hand, then one must be located. This is a quick contest of Sensitivity vs. the spirit’s Trickery. If the sorcerer fails, he must wait one minute for each point by which he lost the contest before he may try to find another spirit. Location is important here. Certain spirits will have certain aptitudes. For example, it will be easier to find an sturdy devil to bind into armour near a great mountain, and a spirit with the gift of illusion magic will best be sought at the end of a rainbow. The referee should assign bonuses accordingly. How long does spiritual combat take? What if the sorcerer loses? Sounds like curtains. The sorcerer becomes a servant, bound into the item in question. A spirit will be bound into an item, it can then be compelled to cast all manner of spells. Specialised Bindings: to produce magic weapons, etc, and wands. Generalised Bindings: to bind a servant into an item so that it can be summoned, genie-like, for general purposes. A wizard can also try the same trick on a human being (perhaps even another wizard, if he is particularly brave or foolish). Again, that human can be enslaved or bound into a weapon, and if the human in question has spell-casting ability it can be commandeered. One idea is that every spell cast costs the sorcerer one attribute or skill point permanently: this makes spell-casting a serious business indeed! But most spells are long-lasting (a year and a day), or permanent (enchanting wands, rings and books, or summoning familiars and faltyns), or very powerful. Since Faith and Pride are close substitutes in many instances, there is the nice side-effect that many sorcerers will choose to burn Faith first, and become truly Godless. Really hard sorcerers can get instant special effects without burning attributes – these will be special abilities (perks of their Myth level), not spells. We should also consider making sorcerous combat analogous to physical combat, using Pride in place of Attack, and Pride or Faith in place of Defence. Bonuses / penalties depending on the effect (and whether it tampers with God’s law). Most actions are resolved as contests of skill. If there are two characters/animate objects involved, both roll and add the relevant skill. If there is only one character involved, either against the environment (climbing a cliff, for instance) or against some internal challenge (rolling to stay conscious when wounded), then only one roll is made. Each combatant acts in order of the result; action can be delayed voluntarily if desired until later in the turn. The attacker rolls and adds Attack. The defender rolls and adds Defence. If the attacker wins, he does damage equal to the margin of victory – this added to the victim’s total of wounds. Defender must roll vs Toughness to avoid ill effects (see below). If the defender wins, he may elect to counter-attack, using his margin of victory as an Attack score. However, he will in turn be vulnerable to a counter-riposte from the attacker, and so on. Thus, each attack can descend into a frantic flurry of blows and counter-blows. This will not usually happen, however, since a defender with a narrow margin of victory will be ill-advised to launch a riposte. Keep a track of cumulative wounds. Each time an injury is suffered, roll Toughness vs (Wounds + 5). A failed roll means that the character is stunned and has Attack and Defence of 0, until this time next turn. A roll failed by more than five means that the character is knocked out. A character whose cumulative wounds score is greater than his Toughness must roll Wounds vs Toughness every time a further wound is taken, or die. The combat procedure described above assumes that both combatants are fighting normally – ie, giving some thought to defence but also attempting to make an attack of their own. Alternatively, a character may opt to be overtly defensive in combat in two ways. In both cases described below, he sacrifices his own attack. This is the fully defensive stance. The defender adds his Attack score to his Defence score to work out his effective Defence for the turn. However, no riposte is possible. A less defensive stance – here, the defender bides his time and waits for the opportunity to counter-attack. Again, the defender sacrifices his own attack. His effective defence is equal to half his Attack (round down) plus his Defence score. He does not pass up the opportunity to make a riposte, but if the attacker makes a counter-riposte, then the bonus to defence does not carry. Sir Rolf and Squire Lennox are in battle. Rolf has ATT: 14, DEF: 14, TOU: 13, REF: 10. Lennox has ATT: 11, DEF: 10, TOU: 10, REF: 11. Rolf rolls (-4) on Reflexes, total 6. Lennox rolls (-3), total 8. Both gentlemen clearly a little slow off the mark. Lennox swings a blow at Rolf, rolls (-1), total 10. Rolf’s defence roll is (+1), total 15. Rolf wins by five and elects to riposte. Rolf rolls (+6), added to his riposte attack of 5, total 11. Lennox rolls (-3), total seven. Rolf’s counter-attack wounds Lennox for four points. Lennox needs to roll Toughess vs Wounds+5 or be stunned. He rolls Toughness (-1), total 9. He Wounds are 4, plus 5, total 9. It’s a draw, so he just keeps his wits about him in time to meet Rolf’s attack. Rolf rolls (+2), total 16. Lennox rolls (+10! ), total 21. Lennox, somewhat desperately, decides that he, too, will press his luck and riposte (with an effective attack of 5). Lennox’s riposte is (-4), total 1. Rolf’s defence is (-1), total 13. Rolf wins by 12 and launches a counter-riposte. Rolf’s counter-riposte is (-2), total 10. Lennox rolls (-3), total 7. Rolf has won by three and deals another three wound points to Lennox. Now Lennox needs to roll Toughness vs Wounds+5 again, or be stunned (if he fails by five or more, he is knocked out). His total wounds are 7, and he rolls (-2); he has just missed fainting, but is stunned. The combat round ends, and with a vicious grin, Rolf swings his mace at the dazed Lennox. Rolf rolls (0), total 15. Lennox’s effective defence is 0. He rolls (+6), but still loses by 9 and takes another 9 wounds. Now Lennox must roll against cumulative wounds of 16, +5 to avoid stun. He rolls (+8), with Toughness of 10, he is stunned again, but still on his feet. That said, he might be wise to go down at this point, since if he takes another wound and then fails a check on Toughness vs Wounds he’ll die of his injuries. The die rolls in this combat were genuine. Notice that although Lennox was a bit unlucky, he hastened his own demise with a very unwise attempt at a riposte. It’s also interesting to see that Rolf struck Lennox twice in one round, and both times with a counter-attack. This is fairly typical when one reads accounts of real combat, although in most DW II combats ripostes would be less likely. Missile combat takes the same form as melee combat, with two main differences. First, in place of the Defence score is a difficulty rating, based on range plus other modifiers. For close-range weapons like rocks, axes, knives and javelins, the difficulty rating equals the range in feet. For long-range weapons like bows and crossbows, the difficulty rating equals the range in fathoms (ie divide the range in feet by six). Shields add two to defence (and two to the difficulty rating of missile attacks). This does carry through to a riposte, since a shield can enable an aggressive response to an attack. Here's the first part of Tim Harford's design outline for DW II, which he wrote following our long discussion (one of many) about where the rules needed to go. Another project I'd love to get back to one day! The idea behind Dragon Warriors II is to wipe out whatever is clunky and archaic about the original rules, and to add certain new elements to the rules – while keeping the connections with the original system visible. - Mechanistic rules for spell casting. DW II needs a more comprehensive skill system, although the number of skills will still be small. We also need a system for dealing with faith, which is central to Legend but not reflected in the rules. There’s a question mark as to whether DW II should have “rank”. The desire to reflect the fact that some people are heroes and others are not, argues to keep “rank”. On the other hand, there’s little use for the concept in a skill-based system, which is what DW II is. The compromise is this: high skills or attributes give access to special abilities; but the nature of the special ability depends on the Myth Level of the character. Only adventurer-types, that is “lead characters” such as player-characters and important NPCs, will have Myth Levels. Most people are Myth Level 0 no matter how highly trained in any given skill. For instance: a character with Myth Level 1 reaching Defence: 15 can choose a plausible but impressive special ability such Leaping Dodge or Quick Draw. Myth Level 2 would give a choice of distinctly cinematic manoeuvres such as Arrow Cutting. Myth Level 3 offers The Elf King’s Parry, where the attacking weapon turns out to have been in the defender’s hand all the time, or The Ghost’s Walk, where the defender evades by stepping through the attacker – feats that are not just cinematic but clearly magical. We explicitly want to avoid DW II becoming too much like a conventional level-based system. There are many other ways to distinguish between two characters of the same myth level, and so three Myth Levels (four, if you include Myth Level Zero) are enough. Players would earn their first Myth Level quite easily, for winning their first important battle or pulling off an exceptional and story-worthy feat. Myth Level 2 is harder, the sign that the character is now a hard-bitten adventurer. Myth Level 3 is reserved for the characters who have achieved legendary status in the campaign. The use of special abilities is an attempt to deal with several problems at once. Special abilities are a way of layering all kinds of special cases and exceptions over a basic set of rules that are (hopefully) clean and flexible. The very fact that special abilities break those rules are part of the fun. Using special abilities in conjunction with Myth Levels also breaks the direct connection between being skilled and being a hero. The highly magical special abilities also blur the distinction between the magical and the material – a distinction which should be blurred in Legend. Sorcerers achieve some of their effects by having mythical abilities associated with Pride; others are spells, and yet others are the result of alchemy or hellish bargains. It’s messy, but it’s messy within the same system that applies to warriors – heroes get their results in unusual ways. Usually, they oppose each other in contests of skill, but not always. Let’s leave to one side how those skills and attributes are generated. Suffice it to say that we have in mind a 3-18 / 1-20 sort of scale, but because DW characters are heroes there is nothing to prevent both attributes and skills going off the scale. Special abilities kick in at skill 15. 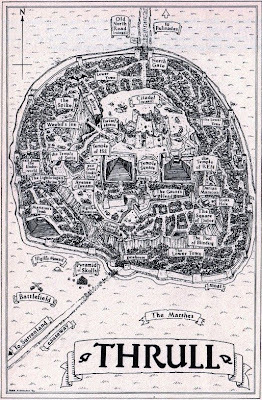 A guest post of sorts today from my very dear friend and fellow gamer, Tim Harford, who has achieved fame in the mundane world as the Undercover Economist, but who is better known to us as the brilliant GM of the very best Legend games ever, as well as being forever remembered as the creepily untrustworthy Kal Ki-Lan Tor, Krarthian mage and ne'er-do-well. A few years ago - well, all right, a decade or more - Tim and I were chatting in the canteen of the Clapham Picture House about doing a full revamp of the Dragon Warriors rules. This wasn't just to be the continuation of the series contemplated with the Invaders & Ancients books, but a ground-up overhaul to create a system that would really deliver the land of Legend as it "really" is. Any set of game rules needs to honour the 'reality' of the game world rather than any kind of historical reality, however construed. Judge Dredd RPG rules [the version by Marc Gascoigne and Rick Priestley] allow an experienced Judge to get of well-targeted shots eight or nine times in a round while an inexperienced perp will be lucky to get off a single shot. The rules are completely 'unrealistic' but true to the source. In contrast, the old Middle-Earth Role-Playing (MERP) rules feature ubiquitous spell-casting, which really doesn't chime true. At the same time, the rules also need to trade off faithfulness to the source against speed of play. Alignment fails to do justice to Legend. There are more variables at play: a character's status, his face, his faith (with various heresies imaginable), etc. Then there are the Ta’ashim, who are quite outside the standard world view defined by the 'True Faith'. Elves are also neither good nor evil. I've not found rules-based approaches which help me much here. I don't feel DW needs an overhaul to improve its 'realism'. It's fast and fun, which is one of the appeals. But it would be nice to get some more player-choice into combat. Dave's later systems allow simple choices: full attack, two half-attacks, half-attack and half-parry, full parry. Without going crazy it does improve the quality of the combat experience, which in DW is either mindless die-rolling, or improvised out of all connection to the combat rules. Frazer Payne has a system which draws heavily on Maelstrom's magic system. The idea is that magic is easier if it doesn't noticeably contravene the laws of nature. You can teleport up to a high window to make an escape, providing you're out of the line of sight: after all, it's just conceivable that you climbed up instead. Similarly, people falling over, gusts of wind blowing windows shut, etc. This introduces a nice and elegant constraint on spell-casting. Alternatively, magic might need to be performed in advance. 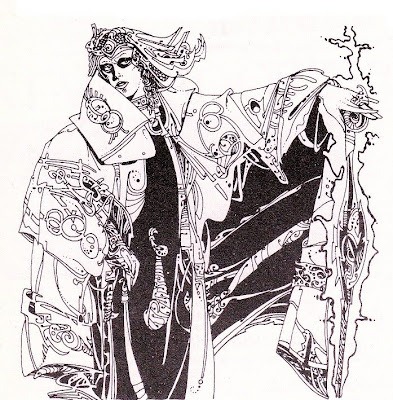 Sorcerers would carry with them all kinds of trinkets and scrolls into which had been embedded one-shot spells. I toyed for a while with making most magic a battle-of-wills with otherworldly forces. Sorcerers don't cast spells, they summon sprites or sandestins (faltyns) and force them to cast the spells instead. This makes every spell risky and also leaves open the possibility of favours being traded, hard bargaining, and so on. Sorcerers can make enemies, but also allies, in the Otherworld. An option is to allow sorcerers to cast spells directly rather than relying on spirits, but to suffer permanent damage as a result. GURPS Magic has a nice but under-developed system of 'rune magic'. Each rune is a verb or a noun (of a quite generic nature, such as 'flesh' or 'stone', 'create' or 'move'). More elaborate spells need more runes and more skill. Bonuses for using proper runes (runestones, runes on scrolls) and penalties for improvised solutions (tracing runes in the air or in the dust). 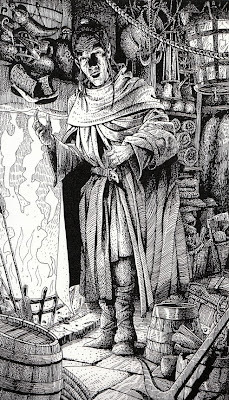 In my own long-running campaign, Cynewulf Magister, Montombre's court sorcerer, was a formidable rune mage. None of the players had a good idea of how he was doing it (and indeed I was playing fast-and-loose with the rules). I am not sure the rules would really cope if played straight. Monsters. The monster list in DW is just daft - a relic from a bygone age when people thought this kind of thing was a good idea. There is little enough sign of such foolishness in Dave's DW scenarios: most of the monsters are eerie (wights, boggarts) and the most memorable ones are human. In the most recent game Dave ran, set in Krarth, we encountered: the freaks from a gypsy circus; Koschei the Deathless (a fleshless apparition who stole the skin of others as a disguise, and whose heart was contained within a silver box in a silver minaret); a strange giant stork-like bird (Oliver Johnson found a titanic egg in the ashes of its burning nest and pronounced 'This is the egg of the world, my friends' before breakfasting upon it); and finally a sorcerer who had been hurled into a glacier twenty years previously and was thawing out, having been horribly disfigured by the long, slow journey to the bottom. There were no orcs and no sign of a Malgash. In my own game there are some staples, like trolls - but they are not the humanoid battering rams of D&D, but skulking creatures who (guess what) have been known to lurk under bridges. Strangulation is a favoured method of attack. Think of a 9-foot tall Gollum. Magic items, when encountered at all, show invariably be the kind of unique artefact described in Book Six. Myth and heroism. I like the 'skills of the mighty' section but feel that such skills should get ever closer to magic... such as 'The Ghost Road', where the defender evades the attacker by turning out to be standing behind him, or 'The Elf King's Parry', where the defender parries a sword bare-handed, only for it to turn out that the defender who has the sword and the attacker whose hand is wounded. We also need to go further in exploring the idea that a character is of mythic proportions and the rules just aren't the same. Dave gives the example of Little John wrestling with a disguised Richard the Lionheart in Robin of Sherwood. King Richard beats Little John and lifts the man-mountain high above his head - at which point everyone realises who he is. Why did King Richard beat Little John? Not because of superior strength or wrestling skill, but because he's THE LIONHEART, of course. This is where the idea of 'myth levels' comes in - although the name is clunky. Let's say there are four levels: normal, notable, heroic, mythic. Most characters start off as 'notable' and that would give them certain advantages. For instance the 'Hand of Glory' puts 0th rank characters to sleep, but not ranked characters. In the new language, that's a magical effect which works on normals but not on notables. Being of a higher myth level should allow you to shrug off quite a bit of what is going on at a lower myth level. Mythic characters, like Hunguk the Pirate King and Sa'aknathur, simply don't get bumped off by mortals. It isn't the way the world works. 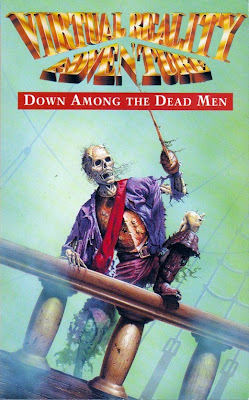 In the case of the Dead Men cover, I don't know if the artist or the art director was responsible for the orientation on the English edition. I suspect the latter, because that would explain why ol' Billy Bones there has the sword in his left hand. Although to really have maximum impact, his head should be turned so he's facing us or looking over our right shoulder. Incidentally, you can try the same mirror-flip trick on yesterday's Blood Sword cover. 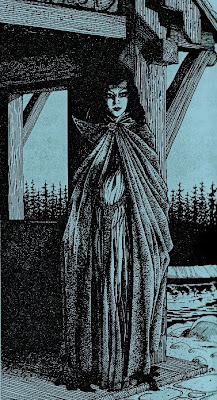 This may be of interest only to the most ardent gamebook collectors or lovers of trivia (hmm, possibly two completely overlapping sets...) but, after all, what's a blog for if not to show off the most obscure of curiosities? 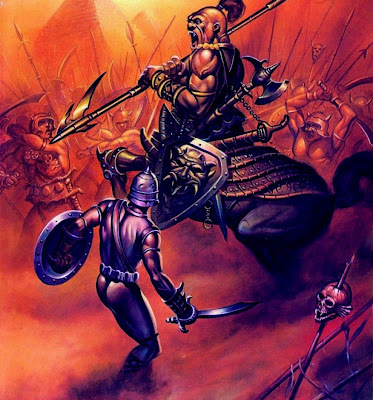 These were the original covers for the Blood Sword gamebooks, which later became the basis for my kids' fantasy series The Chronicles of the Magi. There was a general feeling at the publisher, and Oliver and I agreed, that these covers just didn't have "it". New paintings were duly commissioned. We weren't complaining. It was nice to know our publisher cared. 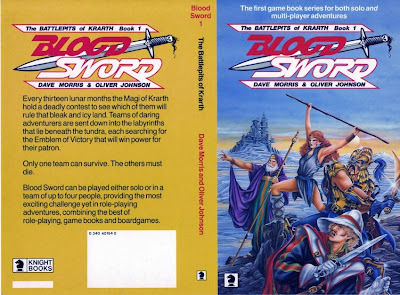 My only regret: when I had finally been persuaded that the series should be called Blood Sword, I said, "Okay, but what I'd really, really hate is if the logo has blood dripping off it." 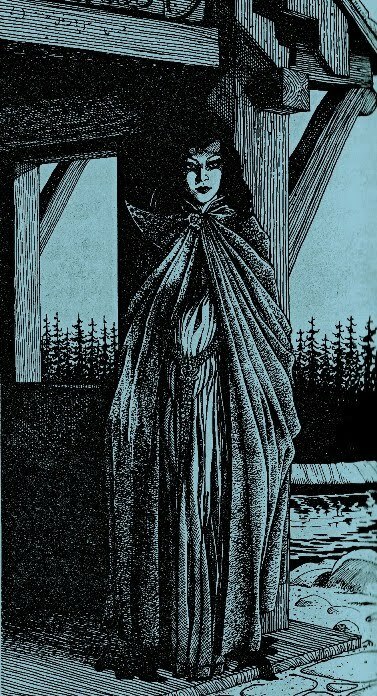 You see, in the '70s there had been a great little periodical called The Magazine of Horror, which reprinted stories from Weird Tales and other pulps of the '30s and '40s, and the editor, Robert A W Lowndes, and most of his readers were forever lamenting MOH's crass, gore-drenched masthead. Thankfully for Lowndes, he finally managed to get his art director to see sense. 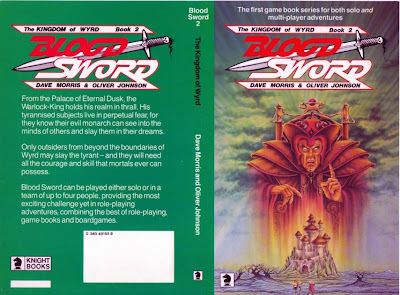 When the new Blood Sword covers arrived, the art director had added a new logo. With, of course, lashings of bright red blood. Arrrrrgh. Each of the Houses of Sardonyx has at least one Vaal. These great armored sentinels stand immobile, sometimes for centuries, animating when the mansion is invaded. They do not act to prevent infiltration by spies, thieves or assassins so it seems that only a military assault will awaken them. The truth of this is known only to the Vaals themselves. Under the massive plates of jade-like armor, the Vaal must be of hulking but humanoid form. All that can be seen of the creature within is a wan, flickering limelight shining behind the mask when the Vaal is active. Any nonmagical weapon that penetrates the Vaal’s armor is exposed to the raw energy within, reducing the weapon’s Armor Bypass Roll by 1 (in the case of edged or thrusting weapons only) until the damage can be repaired by an armorer. Each round, a damaged Vaal regenerates 1 HP. A Vaal cannot be affected by spells that control the mind, including those that create fear or illusions. It is protected at all times by a 2-point Spell Screen (like the Warlock spell). The Vaal’s own magical attack is a bolt of pale green lightning that it can project up to 40m. It must be free of melee for one round in order to build up the charge for this bolt, which is then released at the start of the following round. The bolt strikes one target with SPEED 15, and if not evaded causes 4d6 damage less the target’s Armor Factor, if any. A Vaal’s purpose is to protect the mansion and the family members who live there. It is not under the control of members of the House, but acts to protect them as it thinks best. Barely an hour after dawn they will be starting to rue ever having got embroiled in the theft, as the sun beats mercilessly down on their unprotected heads. Seedob is able to give a ray of hope, however, as he has a chart which he bought in Tamary which purports to show the position of oases along the fringes of the desert. "We follow this wadi north and west for ten leagues and it'll bring us to an oasis," he snaps. Discomfort (and, perhaps, guilt) are fast taking a toll on his temper. "We can refill the pitchers there, then head on north into the Jumbles and rejoin the Ophis at Baristan or someplace like it." Their primary concern must be that the Ruash family will have sent out a party of habdigar soldiers to track them down. By means of incidents such as false sightings and unexplained sounds at night, you should do your best to let this worry play on the protagonists' minds. The thought of these habdigars bearing down in relentless pursuit becomes a metaphor of the protagonists' guilt and will give the mood of the scenario a special resonance. Although some of the protagonists might conceivably hail from arid regions of the world, there are no human cultures indigenous to true sand deserts like the Wastes of Gizen. Therefore players cannot legitimately claim full advantage for levels of the Survival skill: all rolls are at -3. If no characters in the group have Survival, they will have to hazard a guess at how best to survive. In fact their optimum course is to eat as little as possible, and to sip water no faster than the rate at which they are losing moisture due to sweating. It takes no special knowledge to see that they must travel by night and rest by day, as any attempt to cross the sands when the sun is up is tantamount to walking in an oven. Talking should be kept to a minimum, but Seedob has plenty to say about their predicament, and about how he intends to spend his share of the loot, and no doubt protagonists will be unable to resist arguing as the situation declines. The purpose of the scenario is to present characters with a moral choice. There will be a distinct contrast between those who completely give themselves in to greed – allowing them to compound their theft with ever worsening acts of villainy – and those who oppose the Rinder brothers from the start and who go along with them only because they have no choice. The players themselves ought to recognize the tone of the scenario (particularly if they have seen The Treasure of the Sierra Madre) and those who feel they must take the "evil" path to remain true to their roles will presumably realize quite early on that they are probably doomed. Feel free to manipulate any strife or attempts at murder to help "virtuous" characters to survive. Their chances should be borderline, though, so that only determination and intelligence will see a character out of the desert alive. Focus the action on minor details, events that would be too trivial to fully enact in a normal scenario. An argument can be sparked by Hodansyr's insistence on drinking gin even when warned that alcohol is dangerous in such conditions, since Sootan will not take kindly to an employee answering him back. As the situation worsens, Seedob creeps off by his own while the others are sleeping and buries the rubies. He marks the spot with a belt-buckle, but a breeze covers this with sand and it is only later that the others discover that their precious treasure has been lost. By the time they reach the oasis, they should be at the end of their tether: exhausted, virtually delirious with thirst, constantly at one another's throats and with Seedob on the verge of committing murder. The oasis turns out to be dry. Between dusty bushes of scrub they find only a pool of foul black water that no-one could drink. A weary conference can produce only one course of action. They must try to get back to Sardonyx and throw themselves on Tian's mercy. With only a liter of water left to each of them, the journey back is even worse. Any characters who survive to reach Sardonyx will be almost dead on their feet, with blistered lips and skin burned black by the sun and the hot desert wind. The irony of the adventure is that Tian did not care that they had stolen the rubies. After a moment of pique he thought no more about the incident, and did not even bother sending out the expected hunting party of habdigars. In a spirit of whimsy he will allow the survivors to leave unharmed in the barge in which they came. They will return to Tamary having learnt a great deal about themselves and about human nature, and they will have proved that in the final analysis they have the “right stuff" to be heroes. As for those who succumbed to their worst instincts, their bones will by now be buried under the shifting desert sands. The barge is moored at a jetty of moss-clad marble and the protagonists approach the city through half a mile of sculpted gardens and domed pavilions. All are reduced to staring about them in awe. Nothing they have encountered in their whole lives has prepared them for this vast, shimmering city. Their senses are staggered by the sweeping avenues of white stone, the monumental buildings, lawns and colonnades of the great Houses. The streets are vastly empty. Coming to a canal where an Ancient lord sits in a punt trimmed with gold and gems, they get directions to the House of Ruash. It may be their first face-to-face encounter ever with a pureblood Ancient. Ancients tend to be pale of skin with white or golden hair. They are a couple of inches shorter than Invaders on the average, and slighter of build. Their clothing is elaborate and impractical, as they customarily do nothing more strenuous than sit being served by their habdigar servants all day. Beyond a plaza flanked by two rows of grimacing stone idols, they find a collection of colossal buildings set in carefully tended grounds that are dominated by a single trapezoid manse. From the scale they could be rock formations rather than human edifices. The party make their way up a wide stairway that leads up to the main entrance on the third floor of the manse. There they are greeted by a habdigar major-domo who takes the letter of introduction from Seedob before showing them to a side chamber. "Please wait here," it says in its burring voice. 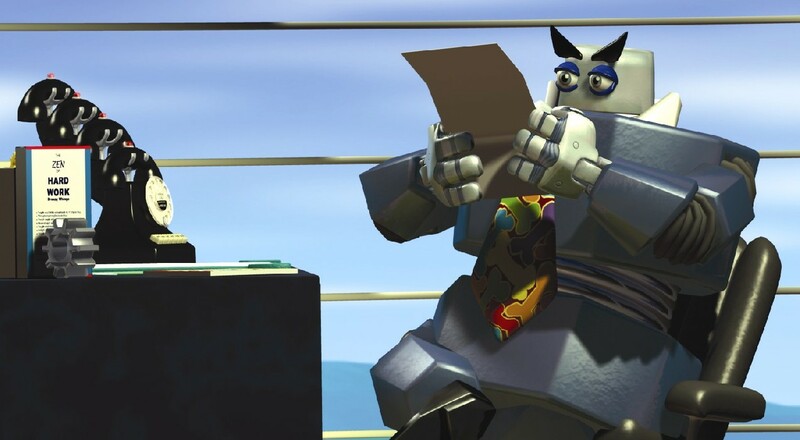 "I will show your document to Lord Tian Zi-Yastu." Habdigar slaves come forwards with jars of perfumed oil that in Deliverance would fetch a good sum. Their orders are to clean the Invaders thoroughly before they are allowed into the presence of Lord Tian. The characters are likely to find the sensation of being massaged by a habdigar quite unpleasant, and Seedob at least insists on washing himself without their help. As they are led to their meeting, they pass through the cool shadows of the great hall, a space as large as a cathedral. Standing against the wall below the massive stairway is a ten-foot tall statue consisting of plates of jade armor decorated with golden bosses on which runes are inscribed. It looks like a giant, empty suit of armor with a visor resembling the face of some frightening demon out of myth. The major-domo will tell them this is the House Vaal. “A statue?” asks Sootan. “A living sentinel,” insists the major-domo, though admitting that the Vaal has not stirred from its place in living memory. The Vaal will only come to life and fight if the House itself is endangered. The protagonists will want to avoid that. Combat stats, etc, should be redundant, therefore, but if you really need them then consider something that would give the Malgash a workout. Aficionados of Prof M.A.R. Barker’s work will recognize the Ru’un as the inspiration for this creature. They are taken to the South Terrace, where white marble masonry shines dazzlingly in the noon sun. A trellis of blue-leafed vines provides shade for a low table set with viands and pitchers of cool wine. Lord Tian Zi-Yastu Ruash sits waiting for them, sucking at a hookah from which wisps of omatique smoke escape to leave a heady scent in the air. He smiles a trifle distractedly and gestures for them to join him. This scene should be played to accentuate the huge cultural gulf that exists between the Invaders and the Ancients. Even superficial details display the pervasive otherness of Sardonyx: the low chairs in which Invaders find it difficult to sit comfortably, the intricate glass goblets and the array of specialized eating-utensils, the bitter wine and the odd disharmonious music that drifts up from the plaza below. As the conversation proceeds, it rapidly becomes clear that, in addition to superficial differences, the two cultures also cannot see eye to eye on a fundamental level. Lord Tian Zi Yastu has no interest in forming trading links with the Sovereign states, and in fact holds all mercantile affairs in deepest disdain. To demonstrate his disregard for wealth, he reaches into a coffer and produces a huge pearl which he drops into the wine-jug. "Wealth dissolves," he muses. "It evaporates. It becomes meaningless. By this action, do I destroy a great pearl, or sully a fine wine?" "Both!" snorts Seedob. "If you can describe this rotgut as wine!" "Both or neither." Tian Zi-Yastu shrugs languorously. "In my library there is a casket containing ten great rubies each the size of a slazzart's egg. My great-great-grandfather Koya En Yastu Ruash brought them back from the Sacred Volcano in the seventh year of the sidereal veil. You could buy the ten best boats on the Scarab with them, and their cargoes also, but I have never even troubled to open the casket to look at them. I doubt if my father did, either." Sootan is looking very troubled. Sharper witted than his brother, he has realized by now that their hopes are turning out to have been a house built on sand. Seedob still thinks Tian is just negotiating to gain an edge. "You're worried about your cut," he says. "It's understandable. You Ancients have been in a lot of deals with us Sovereigners over the ages, and it seems you're always getting the worse side of things. But this deal has enough for us all to profit. My brother and I, we aren't greedy. It'll be one for us, one for you, all the way down the line." Tian exhales a curl of omatique smoke and laughs. "We shall have equal shares in nothing, then, for that is what the venture must come to. It is all very well, but I have my comforts seen to quite adequately as things stand. In my thickest omatique dreams I want for nothing at all. Furthermore, as I have no great wish to see Sardonyx's streets filled with lice-infested and stench-ridden Invaders - my pardon for the discourtesy - I shall have to refuse your offer." "We could take this offer elsewhere..." suggests Sootan. "To another House." The rest of the day is spent under a cloud of disappointment. They may see other Ancients around, and conversations can be extemporized using the source material for Sardonyx. They go early to their beds, intending to depart back to Tamary on the morrow. They have all been put in one chamber, a room partitioned with lacquer screens, on beds made up of thickly padded brocade cushions. In the early hours of the morning, the protagonists are woken by hushed voices. Seedob and Sootan are discussing something in tones of great urgency. When they realise that they have woken Hodansyr and the protagonists, they whisper for them to come over. The brothers are crouched together beside a candle in the darkness. Its flickering light sends ominous shadows across the decorative screen behind them. They have the look of two men caught in the act of discussing something of great wickedness. The protagonists see at once that Seedob is fully clothed, and in his lap he has an open casket. Inside, on a velvet mat, lie ten large, gleaming rubies. "Okay, so I stole the family heirlooms," grunts Seedob. "What of it? What's the Ancient going to care, seeing as he never looked at them anyhow? He won't know they're gone." "His habdigars will," says Sootan. "They patrol the House at all hours. They might come looking for us at any moment, and they will come with drawn knives. We cannot expect Lord Tian to care if his uninvited guests are butchered for thievery in the dark of the night." Hodansyr eases his sword from its scabbard. "Let them come. Knives aren't a problem." It is up to the protagonists to point out the shortcomings in such an approach. Since it is unlikely anyone could get back to the library without being spotted, the rubies cannot be replaced – not that Seedob has any intention of allowing them to do that anyway. Sootan and Hodansyr have already begun to see the advantages of the situation, in that at least they don't end up empty handed. The protagonists have no choice but to go along with the others (presumably some of them, at least, will need no urging) and must now argue over their share. Seedob will maintain strenuously that these rubies do not count as "spoils" but fall more properly under the heading of "profit". He needs the protagonists, though, and he knows it. Finally even he will agree to equal shares for all. With the jetty area well patrolled by habdigar guards, and populous agricultural lands to the north and south, the only escape route lies across the Wastes of Gizen. The hostile, scorching heat of this region is well-known and Sootan has Hodansyr fetch pitchers to use for carrying water. The party make their way across the plaza to the Tessellate Causeway – the mosaic funeral roadway that runs out of Sardonyx into the desert. Everything has taken on an unreal cast in the moonlight. Somewhere, far out in the desert wastes, an unknown creature raises its voice in a solitary, mournful howl. The faint mist veiling the moon is considered an ill omen in Invader folklore, and the protagonists ought to feel that the very stars are looking down in horror at their greed and their betrayal of hospitality. Come back in two days for the concluding installment. The protagonists are hired as guards by two river-merchants from Deliverance who have a letter of introduction to one of the Houses of Sardonyx. Once in Sardonyx, the merchants find their plans for trade foundering, and decide to steal a casket of priceless gems. The entire party is forced to flee across the desert west of Sardonyx, where greed and the self-preservation soon take their toll on civilized conduct. After your last adventure you spend some time in Tamary looking for employment to take you back downriver to Deliverance. A few days later you are shopping for food in the market. It is still early morning, but already the bustle of traders and carts has raised a choking red dust from the city streets. Sweltering in the heat, you are finally forced to take refuge in the shade of a tea-seller's awning where you order a refreshing flask of the local tekoa brew. While sipping this sweet aromatic tea you are approached by two men who have the look of river-merchants. They smile and nod, then seat themselves on stools beside you. The tea-seller scurries to take their order, but one of them tosses him a couple of silver Gentins and waves him away. "Allow us to make our introduction," says this man. "I am Sootan Rinder and this is my brother Seedob. We are merchants from the coast, as you may have guessed from our garb." He indicates his thick fustian tunic, adopting a rueful smile as he mops his damp brow with a silk handkerchief. "Not entirely appropriate for this clime, but it is important to present a prosperous image in our line of business." "Let's come to the point," interjects Sootan, who is clearly less patient and easy-going than his brother. "We hear you've been looking to sign on a boat heading downriver. But how about upriver? My brother and I, we did a service for an old Sardonny who lives down Lamentation way. Got him out of a spot of bother. The fact is it was us that got him into the bother in the first place, but there you are. Anyhow, being so grateful and all, this fellow gave us a letter of introduction to his family in Sardonyx. We're going to see if we can establish a trading depot there. It would be the first Sovereign depot established in Ancient territory, so we're talking big business. Other merchants around here have got wind of it and are getting green with envy – poisonous green. That's why we need guards with a good rep to see us safely in Sardonyx. People like you." He grins and puts a fat bag of gold dust on the table in front of you. Everything these two have said is true. They are prepared to pay the protagonists eight Argurs a day each, plus shares in any spoils that happen to accrue along the way. By "spoils" they mean any plunder there might be from river-pirates or the like. They are not offering a share in their mercantile profits, and they will make this very clear. They have a legal document which sets out at length the full terms of employment. This is binding throughout the Sovereign states. Unless one of the protagonists has the Lawyer skill, assume that the Rinder brothers can use this document to get their own way in any dispute over contractual arrangements. This means that the protagonists will be assured of 8 Argurs a day and a sixteenth share of spoils (the minimum recognized as "a share" in law) but nothing else. Sootan is quiet, even-tempered and thoughtful. He is the brains of the team, and often needs to exert a calming influence on Seedob, who is the more charismatic and abrasive of the two. Both have no loyalty other than towards each other, and will cheerfully treat any companion or employee as expendable if they perceive a chance to turn a profit. 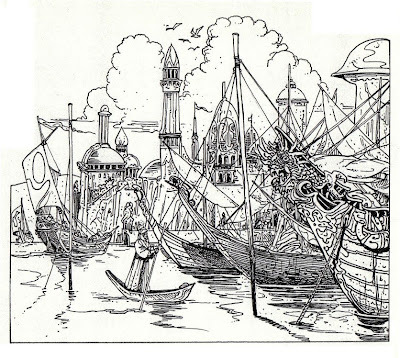 They have a team of low-class servants to act as bearers and have chartered a barge for the journey to Sardonyx. This is crewed by ten Tamary boatmen who should be treated as average 6th level Swordsmen in the event of trouble. In addition, the Rinder brothers are accompanied by a bodyguard called Hodansyr Pallisade. Hodansyr belongs to an impoverished cadet branch of one of Deliverance's noble families. He is an expert swordsman and a feared veteran of many duels, but he is an alcoholic. The brothers know that as long as they keep him away from the bottle they can rely on him for their personal security, but they need men and women of the protagonists' caliber to see to the more unusual obstacles that might arise. Portray Hodansyr as a foppish dandy, fastidious about his looks and ever ready to erupt into hot temper at the slightest hint of an insult to his honor. Though the players will hopefully be anticipating trouble, have the voyage to Sardonyx pass without serious incident. You could throw in some minor encounter if your players need the exercise, but remember that the main thrust of the storyline revolves around the transformation of this venture from a simple trading expedition to a raw, tooth-&-claw struggle for survival. Any significant threats arising before they reach Sardonyx would only dilute the effectiveness of the plot. The journey takes about a week. For most of this time there is nothing for the protagonists to do as the boatmen have everything in hand. The weather is idyllic: a cloudless blue sky overhead, sparkling amber river and fertile green fields to either side. A gentle breeze prevents the heat from becoming too stifling. They can spend the days dozing on the deck, fishing, drinking, chatting to the Rinder brothers and gambling with Hodansyr. Most of the protagonists will probably be able to swim, and this is an ideal way to cool off in the hottest part of the day, just before lunch. The Scarab River is in fact inhabited by crescta: river-dwelling carnivorous reptiles looking something like a ray or a waterborne pterodactyl. These might give chase to a swimmer and supply a moment's frisson of fright. Players could believe their characters do be in real danger, but in fact you should ensure that the crescta's prey manages to scramble back on board before the creature catches him. Such an encounter will be more effective if it ends with a snapping of frustrated fangs and a gale of relieved laughter than if you turn it into an underwater battle like something from a Tarzan film. As the barge travels upriver, they pass the fields where the Ancients' habdigar thralls work at the complex irrigation systems devised long ages past. The protagonists will have seen habdigars before, but to see them teeming in groups, engaged in such a commonplace activity as farming, sets them in a cultural context which to humans must seem eerie. Eventually, around midmorning on the fifth day out from Tamary, they round a bend in the river and catch their first glimpse of Sardonyx. Coming into view to on the starboard bank there are the extensive poppy fields from which the drug omatique is produced. Beyond lies the city itself, its white and rose towers slender as needles against the clear azure sky. In the far distance, miles beyond the city, a line of silvery grey demarks the arid plateau of the western desert. Part 2 in two days.